CLIA's Cruise3Sixty Conference continued today with various activities planned for the agents attending. I decided to take the opportunity to tour Seafarers' House which is located about 10 minutes from Port Everglades. I had the opportunity to meet two of the instrumental figures at Seafarers' House: Rev. Ronald Perkins, Port Chaplain, and Lesley Warrick, Executive Director. They explained their mission to us and gave us a behind the scenes tour of their facility. According to Rev. 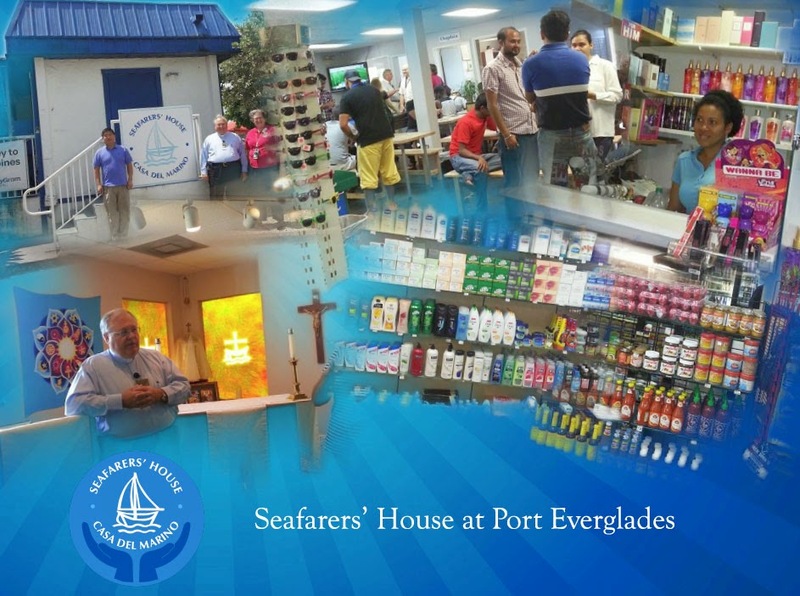 Perkins, "Seafarers’ House at Port Everglades is open throughout the year as a safe, friendly place where mariners can connect with their communities and families, relax, seek guidance and get emergency help if needed. We provide access to pastoral care and counseling, emergency assistance, local ground transportation and everyday items through our pastoral team and our on shore and on board services. Every mariner that arrives in Port Everglades is welcome at our center. Those who may not be able leave their ships due to time constraints or visa restrictions have access to our services from their vessels through our ship-visiting program." Being away from family, friends, and other loved ones is hard. If you've ever been away from someone you love for even a couple days, you can probably imagine what it is like to be away for months on end. Granted, the crew members make new friends, and have their extended families on board the ship, but it just isn't the same. 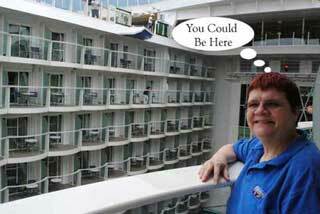 Crew members on a cruise ship are always expected to have a smile for passengers. No matter how down they might feel themselves, they need to do so, or their livelihood could be at risk. This is where Seafarers' House comes in. It could take on many forms, ranging from offering a helping hand, a listening ear, or providing a gift for the holidays. I promised Rev. 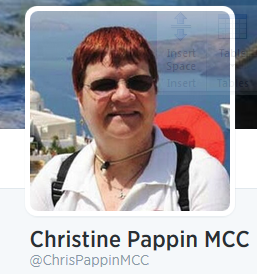 Perkins that I'd spread the word about the good work they are doing at Seafarers' House. Until this FAM trip, I wasn't even aware of their organization, and how the things they do behind the scenes helps my clients and I have an enjoyable vacation. The mariners that are helped by their organization are much more likely to make your trip enjoyable if their problems have been resolved. Your contribution to Seafarers’ House allows them to make a difference, one seafarer at a time. In 2014 Seafarers’ House provided 1,900 ship visits, served more than 2,100 mariners with personalized pastoral care sessions, and distributed more than 1,400 shoeboxes for Christmas. 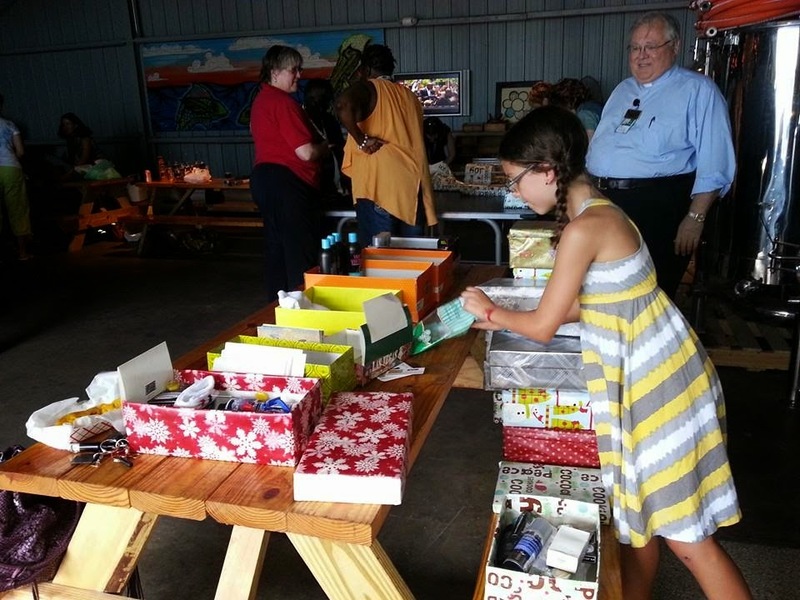 By the way, those of us on this behind the scenes tour had the opportunity to make some shoeboxes to be distributed. 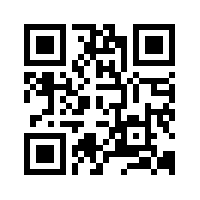 I'll be posting more pictures on my Facebook page, so be sure to visit me there as well. Thank you Father Perkins and everyone at Seafarers' House for what you do for Mariners. 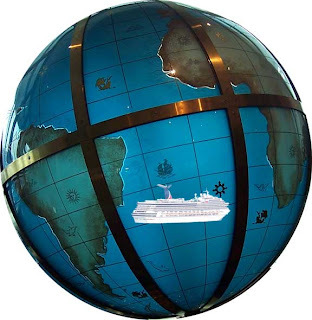 Friends of the Earth’s annual Cruise Report Card compares the environmental footprint of 16 major cruise lines and 167 cruise ships. View a PDF of the report card here. To determine the Air Pollution Reduction grade for each ship in a cruise line, only ships that dock at a North American port that currently provides shoreside power hookups were graded. To determine the Water Quality Compliance grade for ships operating in Alaska, we used 2009 notices of violation issued for individual cruise ships to each cruise line by the Alaska Department of Environmental Conservation. Ships were given an ‘n/a’ if they traveled to Alaska but avoided Alaska’s strong water quality standards by discharging outside of those protected waters. 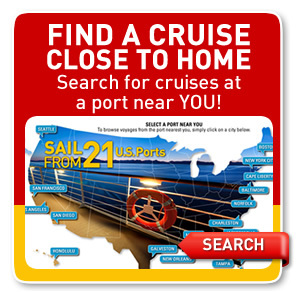 The grades for each of the criteria were averaged to calculate the Final Grade for each cruise line. You take in sweeping views of the leafy shoreline, dotted with castles and centuries-old farm houses, as the cruise ship slowly carries you along the river. You hear horses in the distance. You feel the mellow breeze off the water and breathe in the sweet scent of fresh wildflowers. And then the cabin darkens as the ship moves through a lock. The stone walls so close you can almost reach out and touch them. And yet, you’re not on a balcony. Or sitting on the promenade. You’ve been simply relaxing in bed the entire time -- watching the scenery through a wall-sized window. They include an 11-foot-wide, seven-foot-tall wall of glass that gives you an unobstructed view of whatever you’re cruising past. 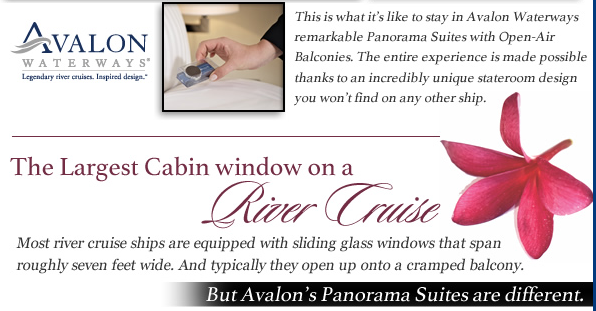 Slide it open and your entire stateroom is transformed into a spacious balcony. Avalon also turned the bed so it faces this massive window, so you can drift asleep watching the star-speckled sky in the evening and then wake to a brilliant sunrise in the morning. 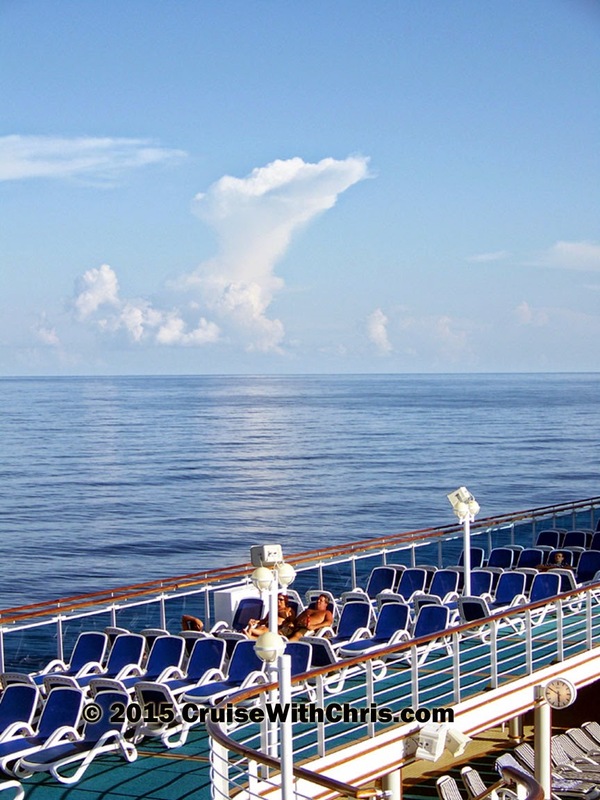 We recommend getting a Panorama Suite on your next cruise. These suites are often booked well in advance because they're so popular. So if you're thinking about a vacation, contact us now to ensure you won't miss a chance to stay in these one-of-a-kind cabins. See more than you could ever imagine on a river cruise. Get up-close and personal to destinations larger ships only dream to go and become one with history, culture and refined grace. 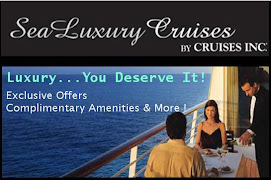 River cruising is becoming really popular and several cruise lines are ramping up to meet the demand. Viking River Cruises continues their aggressive new ship building with the christening of 12 new river cruise vessels in March with plans to build an additional 6 ships. The company named 10 new full-sized, 190-passenger Longships and two scaled-down 96-passenger vessels built in the same style as the Longships. This brings the total to 60 ships in their fleet. 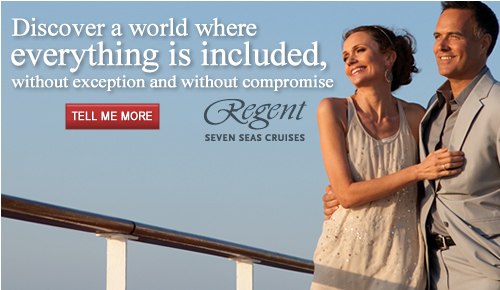 Up until this announcement river cruising was predominantly a couples-only cruise vacation option. The narrow, long, 3 deck ships have cabins that were designed for double occupancy. There were a few exceptions, such as some single occupancy cabins on some AMAWaterways vessels, made possible when additional stairways had to be added for safety. will offer sailings along the Danube River aboard the all-new, 170-passenger AmaViola, a river cruise ship that is being custom built by AmaWaterways with families in mind. New family-friendly design elements include specific room configurations, including six sets of connecting staterooms, as well as some rooms and suites that accommodate three- and four-person families, and other unique details that lend themselves to luxury family vacations. Viking River Cruises has advanced public awareness about river cruising and with their unprecedented expansion. Now, with the partnership of AMAWaterways & Adventures by Disney, river cruising has been taken to yet another level as families can be introduced to this great way to explore Europe. As with all cruises, you'll want to speak with a professional to determine which cruise is right for your particular vacation situation. While all the river cruise ships look alike, they all have something different to offer. 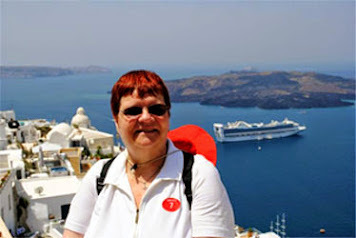 Exploring the world by cruise ship is a passion that we've had for more than 30 years. On our first cruises, each destination was a new adventure. We had not been to the ports of call before, so everything was brand new. After all those years, we still do have some new ports to explore, but more often than not, we find ourselves visiting some of the same destinations. 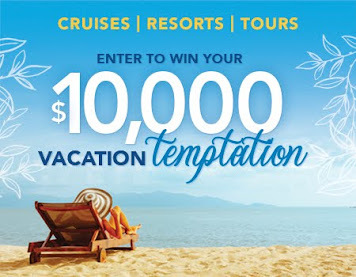 How does one keep cruise vacations exciting? 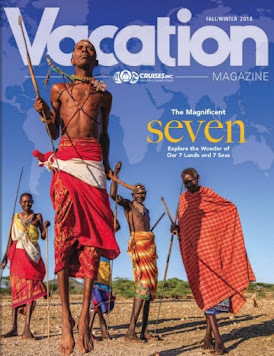 Several ways come to mind, such as cruising to new destinations, booking brand new ships, or trying different shore excursions. 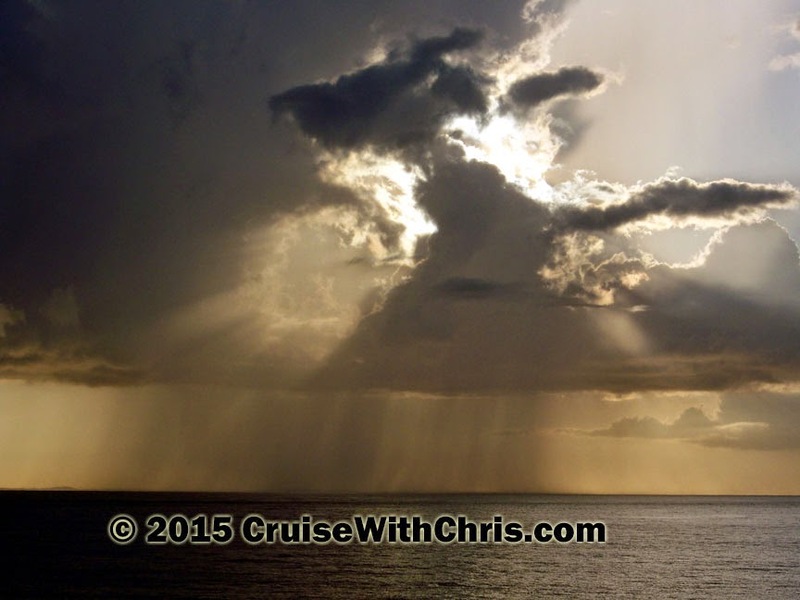 The image above is the view that the captain has on Caribbean Princess. What a marvelous view it is, especially on a beautiful day. 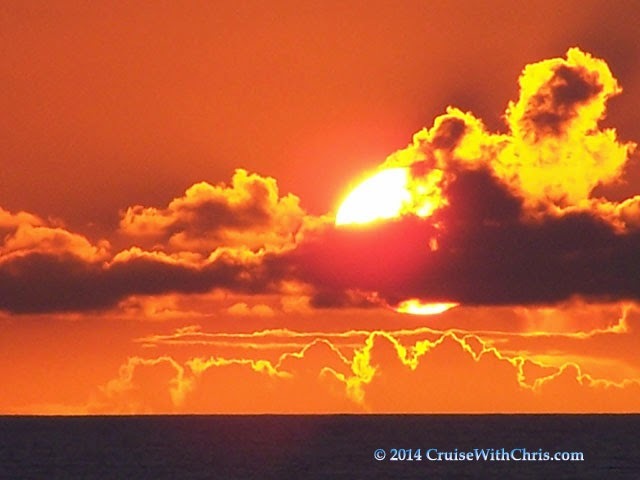 In this image, there are some beautiful clouds above the horizon just off the bow of the ship. There isn't any island in sight - you can look for miles, but all that you'll see is ocean and clouds. You can become one with nature in these peaceful surroundings. This week's #FriFotos theme is #SKY and we've posted some of our images from our trips. Sea days are a favorite time during a cruise for us. It gives us time to really relax and unwind. When in ports, we tend to be "on" since we have easy access to the internet and our always-connected life style (checking on our guests needs for example). It is a little more difficult when at sea, we have to go to our cabin and get connected. Even on stormy days, one can enjoy the view - especially if the storm is in the distance. Our favorite time of day is dusk when Mother Nature puts on a light show for all to see. This image, captured off the coast of Puerto Vallarta, Mexico, has the sky on fire. We highly recommend being on your balcony or up on the open decks when the evening is approaching so that you can experience this magical light and, if you want to, capture your own memorable images. Hopefully this shows you that even if your ship is sailing to familiar ports, there is so much more to See at Sea. 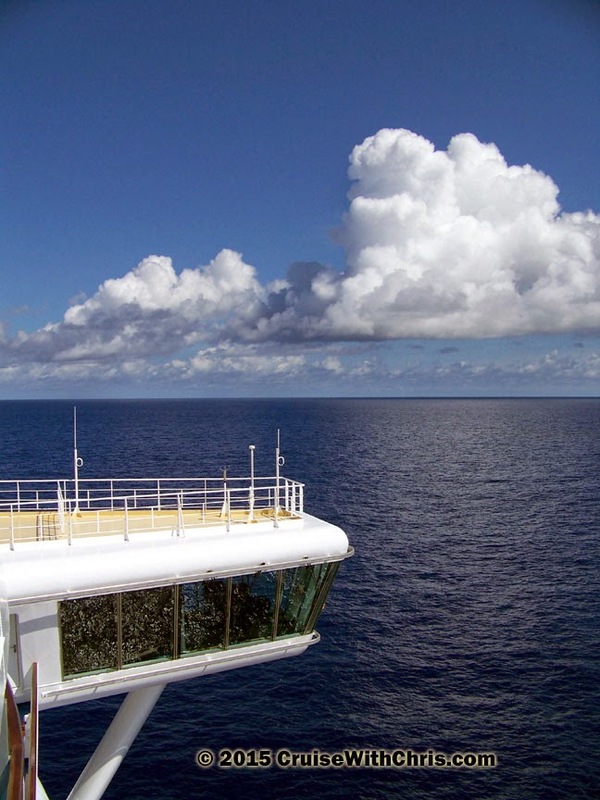 Make some time during your cruise to lay out on deck and watch the clouds go by. Do you remember trying to figure out what shapes could be seen in the clouds when you were young? Why not do that again now, or even share that experience with other family members or friends?